SPITZER SHOP ATTRIBUTED, NEW MARKET, SHENANDOAH VALLEY OF VIRGINIA KENTUCKY-STYLE LONG RIFLE, tiger maple full-stock with brass patchbox, inlays including thumb plate and cheek-piece and double set triggers. Later percussion conversion. Has ramrod. Probably Henry Spitzer (1767-1840), New Market, Shenandoah Co., VA. First quarter 19th century. 45.5″ barrel, 60.5″ OAL. Very good condition. Fully functional… Provenance: Property of John Gray of Lebanon, Russell County, VA. By descent from John Gray to his son John Tevis Gray Sr to his son John Tevis Gray Jr.to his son Wilbur (Sandy) Gray to me. 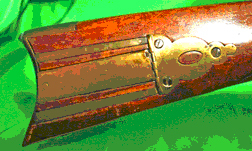 The rifle was in need of repair when I received it… The restoration was done by Paul Horowitz, an archival restorationists, thru Little Johns Gunshop in Santa Ana… All work was done using the same tools and materials which were available when the rifle was manufactured back in the very early 1800’s. My wife and I recently attended the Grand Opening of Bullseye Sport, held on November 11th and 12th, at their new location in the City of Riverside at 6710 Brockton Avenue. The event was well attended and enhanced with several drawings and refreshments. Owners, Philip Pressler (left) and Vincente Torres, have been in business for over 25 years. Seven years ago the business was moved from Downey to the City of Riverside, where they occupied a building less than half the size of the building they are now in, which is just across the street from their old location. When we arrived we were greeted by Alex who, remembering my wife had purchased a. Henry 22. from them a couple of weeks ago, pointed out a sale they were running on Winchester .22 ammunication. He also remembered her sister had just purchased a Sig 40 and that ammo was also on sale. Vincente (second from left, his wife Lilia, son Alex (far right) and daughter Shelsy (far left) all actively participate in operating the customer friendly store. While talking to Lilia we learned Vincente began working in the business at 18. He started his career at B&R Sales and then went on to Turners and then Sports Kingdom before realizing his dream of opening and operating his own business. When asking Lilia what Bullseye’s specialty was she responded, “personalized customer service; we want to keep our prices down and affordable and provide a customer friendly shopping environment and to promote the 2nd amendment”. In keeping with their policies the store does offer a 90 day lay-away plan and we found their pricing to be very competitive..
Lilia also stated that both she and her husband immigrated “legally” into the United States from Cuba in 1969. Although a mere 11 years old Lilia remembers that in Cuba, under Castro’s communist rule, the people lost their right to own and possess firearms; their guns were confiscated along with their freedom of speach and any other freedoms they previously had known. Bullseye Sport operates a very “customer friendly” store. When you walk in the door you immediately feel welcome. Their business hours are Monday thru Friday 10 AM to 6:30 PM. They are open Saturdays from 9 AM to 5 PM unless they are participating in local gun shows. If you are planning on visiting them on a Saturday it is best to call ahead at 951-823-0211. Your can also E-mail them at bullseyesport@yahoo.com for the location of upcoming gun shows they will be attending. Be sure and check out their website at www.bullseyesport.com for specials and announcements. Bullseye Sport carries a large variety of handguns, sporting and tactical rifles and shotguns from all of the leading manufactures. They can custom order any firearm you may be interested in and will gladly accept FFL transfers from out of state stores. While we were at the grand opening we noticed the store is well stocked with accessories, sporting and tactical scopes, ammunication, reloading supplies, sporting and tactical gun cases and shooting bags with new lines and inventory arriving daily..
Future plans include adding an indoor range. As Lilia explained; “our goal is to provide the shooter with everything they need under one roof”. There are even attachments to use with the 10 round Ruger magazines whereby you can mount 3 or 4 magazines together for a more enjoyable shooting experience… The 10-22 mags and the quad holder runs around $12 each. You can catch them on sale and they are a great investment… [Editors note] If you plan on purchasing a high capicity mag note the less expensive ones, with the plastic lips, will not work very well. They will stove pipe your rounds. Spend a little more and get the better quality mags with the metal lips for smooth feeding. Here is the finished product… A PGO, Ruger 10-22 Tack Driver, ala Cousin Paul… How sweet it is!